The Christmas season, also called the festive season, the holiday season (mainly in the U.S. and Canada), or simply the holidays, is an annually recurring period recognized in many Western and Western-influenced countries that is generally considered to run from late November to early January, defined as incorporating at least Christmas, and usually New Year, and sometimes various other holidays and festivals. It incorporates a period of shopping which comprises a peak season for the retail sector (the "Christmas (or holiday) shopping season"), and a period of sales at the end of the season (the "January sales"). Christmas window displays and Christmas tree lighting ceremonies when trees decorated with ornaments and light bulbs are illuminated, are traditions in many areas. In the Roman Catholic Church, the term "Christmas season" was considered synonymous with Christmastide, a term associated with Yuletide, which runs from December 25 (Christmas Day) to January 6 (Epiphany), popularly known as the 12 Days of Christmas. However, as the economic impact involving the anticipatory lead-up to Christmas Day grew in America and Europe into the 19th and 20th centuries, the term "Christmas season" began to become synonymous instead with the traditional Christian Advent season, the period observed in Western Christianity from the fourth Sunday before Christmas Day until Christmas Day itself. The term "Advent calendar" survives in secular Western parlance as a term referring to a countdown to Christmas Day from the beginning of December. Beginning in the mid-20th century, as the Christian-associated Christmas holiday became increasingly secularized and central to American economics and culture while religio-multicultural sensitivity rose, generic references to the season that omitted the word "Christmas" became more common in the corporate and public sphere of the United States, which has caused a semantics controversy that continues to the present. By the late 20th century, the Jewish holiday of Hanukkah and the new African American cultural holiday of Kwanzaa began to be considered in the U.S. as being part of the "holiday season", a term that as of 2013 has become equally or more prevalent than "Christmas season" in U.S. sources to refer to the end-of-the-year festive period. "Holiday season" has also spread in varying degrees to Canada; however, in the United Kingdom and Ireland, the phrase "holiday season" is not widely understood to be synonymous with the Christmas–New Year period, and is often instead associated with summer holidays. The tradition of celebrating the birth of Christ on December 25 appears to date from the 4th century when Christianity was adopted as the official religion of the Roman Empire. In the Christian tradition the Christmas season is a period beginning on Christmas Day (December 25). In some churches (e.g. the Anglican Communion) the season continues until the day before the Epiphany, which is celebrated either on January 6 or on the Sunday between January 2 and 8. In other churches (e.g. the Roman Catholic Church) it continues until the feast of the Baptism of the Lord, which falls on the Sunday following the Epiphany, or on the Monday following the Epiphany if the Epiphany is moved to January 7 or 8. If the Epiphany is kept on January 6, the Church of England's use of the term Christmas season corresponds to the Twelve Days of Christmas, and ends on Twelfth Night. This short Christmas season is preceded by Advent, which begins on the fourth Sunday before Christmas Day: the majority of the secularized Christmas and holiday season falls during Advent. The Anglican Communion and some Protestant churches follow the Christmas season with an Epiphany season which lasts until Shrove Tuesday which is also known as Mardi Gras or 'Fat Tuesday'. Other European cultures have their own carnival festivities between new year and Lent. According to Yanovski et al., in the United States the holiday season "is generally considered to begin with the day after Thanksgiving and end after New Year's Day". According to Axelrad, the season in the United States encompasses at least Christmas and New Year's Day, and also includes Saint Nicholas Day. The U.S. Fire Administration defines the "Winter Holiday Season" as the period from December 1 to January 7. According to Chen et al., in China the Christmas and holiday season "is generally considered to begin with the winter solstice and end after the Lantern Festival". Some stores and shopping malls advertise their Christmas merchandise beginning after Halloween or even in late October, alongside Halloween items. In the UK and Ireland, Christmas food generally appears on supermarket shelves as early as September or even August, while the Christmas shopping season itself starts from mid November when the high street Christmas lights are switched on. The precise definition of feasts and festival days that are encompassed by the Christmas and holiday season has become controversial in the U.S. over recent decades. While in other countries the only holidays included in the "season" are Christmas Eve, Christmas Day, St. Stephen's Day/Boxing Day, New Year's Eve, New Year's Day and Epiphany, in recent times, this definition in the U.S. has begun to expand to include Yule, Hanukkah, Kwanzaa, Thanksgiving and Black Friday. Due to the phenomenon of Christmas creep and the informal inclusion of Thanksgiving, the Christmas and holiday season has begun to extend earlier into the year, overlapping Halloween and Guy Fawkes Night in commonwealth countries. In the United States, the holiday season is a particularly important time for retail shopping, with shoppers spending more than $600 billion during the 2013 holiday season, averaging about $767 per person. During the 2014 holiday shopping season, retail sales in the United States are forecast to increase to a total of over $616 billion, up from 2013's $602 billion. The average US holiday shopper is expected to spend over $800, of which close to 73 percent will be in gifts. In 2015, retail sales in the United States increased to a total of over $630 billion, up from 2014's $616 billion. The average US holiday shopper spent on average $805. More than half of it was spent on family shopping. It is traditionally considered to commence on the day after American Thanksgiving, a Friday colloquially known as either Black Friday or Green Friday. This is widely reputed to be the busiest shopping day of the entire calendar year. However, in 2004 the VISA credit card organization reported that over the previous several years VISA credit card spending had in fact been 8 to 19 percent higher on the last Saturday before Christmas Day (i.e., Super Saturday) than on Black Friday. A survey conducted in 2005 by GfK NOP discovered that "Americans aren't as drawn to Black Friday as many retailers may think. ", with only 17% of those polled saying that they will begin holiday shopping immediately after Thanksgiving, 13% saying that they plan to finish their shopping before November 24 and 10% waiting until the very last day before performing their holiday gift shopping. In 2005, the kick-off to the Christmas and holiday season for online shopping, the first Monday after US Thanksgiving, was named Cyber Monday. Although it was a peak, that was not the busiest on-line shopping day of that year. The busiest on-line shopping days were December 12 and 13, almost two weeks later; the second Monday in December has since become known as Green Monday. Another notable day is Free Shipping Day, a promotional day that serves as the last day in which a person can order a good online and have it arrive via standard shipping (the price of which the sender pays) prior to Christmas Eve; this day is usually on or near December 16. Four of the largest 11 on-line shopping days in 2005 were December 11 to 16, with an increase of 12% over 2004 figures. In 2011, Cyber Monday was slightly busier than Green Monday and Free Shipping Day, although all three days registered sales of over US$1 billion, and all three days registered gains ranging from 14% to 22% over the previous year. Analysts had predicted the peak on December 12, noting that Mondays are the most popular days for on-line shopping during the holiday shopping season, in contrast to the middle of the week during the rest of the year. They attribute this to people "shopping in stores and malls on the weekends, and [...] extending that shopping experience when they get into work on Monday" by "looking for deals, [...] comparison shopping and [...] finding items that were out of stock in the stores". In 2006, the average US household was expected to spend about $1,700 on Christmas and holiday spendings. Retail strategists such as ICSC Research observed in 2005 that 15% of holiday expenditures were in the form of gift certificates and that that share of expenditures was rising. On the basis of that they recommended to retailers a strategy of managing their inventories for the entire holiday shopping season with a leaner inventory at the beginning of the season and the addition of fresh winter merchandise for the January sales. In the Republic of Ireland and the United Kingdom, the Christmas shopping season starts from mid-November, around the time when high street Christmas lights are turned on. In the UK in 2010, up to £8 billion was expected to be spent online at Christmas, approximately a quarter of total retail festive sales. Retailers in the UK call Christmas the "golden quarter", that is, the three months of October to December is the quarter of the year in which the retail industry hopes to make most money. In Ireland, around early December or late November each year, The Late Late Toy Show is broadcast on Irish television, which features all the popular toys throughout the year being demonstrated and showcased before the holiday season and shopping sprees commence. The Netherlands and Belgium have a double holiday. The first one, the arrival of the Bishop Saint Nicholas and Black Peter, starts about mid November, with presents being given on December 5 or 6. This is a separate holiday from Christmas, Bishop Saint Nick (Sinterklaas) and Santa Claus (Kerstman) being different people. Netherlands and Belgium often do not start the Christmas season until December 6 or 7, i.e. after Sinterklaas has finished. In Sweden, where the first Sunday of Advent marks the start of the Christmas and holiday season, continuing with Saint Lucy's Day on December 13, followed up by Christmas before the Mellandagsrea (between days sell off) traditionally begins on December 27 (nowadays often December 26 or even December 25) and lasts during the rest of the Christmas holiday. It is similar to Black Friday, but lasts longer. They last 34–35 days. Black Friday itself has also gained publicity in Sweden since the early-2010's. The Swedish Christmas and holiday season continues over Epiphany, and finally ends on St. Knut's Day when the children have a Knut's party. Hong Kong, China has a lot of seasonal activities and traditions to offer around Christmas time. December 25 and 26 are Public Holidays that makes most shops open for shopping. Locals and tourists love to watch the 30-meter Swarovski Christmas tree in the Central as well as the Christmas light displays on buildings on Victoria Harbour. A huge party in Hong Kong called Winterfest is celebrated every year which involves malls, shops, theme parks and other attractions. The Philippines has the longest Christmas season, reportedly. As early as September, up until January 9, which is the feast of the Black Nazarene (the season ends on the Feast of the Lord's Baptism on the 2nd Sunday of January or the Monday after Epiphany if the 2nd Sunday is marked as such), Carolers can be typically heard going door to door serenading fellow Filipinos in exchange of money. All over the entire country, parols (star shaped lanterns) are hung everywhere and lights are lit. Simbang Gabi or dawn masses start December 16 and run for nine days up until Christmas Eve. "Happy Christmas", an equivalent greeting that is more common in Great Britain and Ireland. These greetings and their equivalents in other languages are popular not only in countries with large Christian populations but also in the largely non-Christian nations of China and Japan, where Christmas is celebrated primarily due to cultural influences of predominantly Christian countries. They have somewhat decreased in popularity in the United States and Canada in recent decades, but polls in 2005 indicated that they remained more popular than "Happy Holidays" or other alternatives. "Merry," derived from the Old English myrige, originally meant merely "pleasant, agreeable" rather than joyous or jolly (as in the phrase "merry month of May"). Christmas has been celebrated since the 4th century AD, the first known usage of any Christmas greeting dates was in 1565, when it appeared in The Hereford Municipal Manuscript: "And thus I comytt you to God, who send you a mery Christmas." "Merry Christmas and a Happy New Year" (thus incorporating two greetings) was in an informal letter written by an English admiral in 1699. The same phrase is contained in the 16th century secular English carol "We Wish You a Merry Christmas," and the first commercial Christmas card, produced in England in 1843. Also in 1843, Charles Dickens' A Christmas Carol was published, during the mid Victorian revival of the holiday. The word Merry was then beginning to take on its current meaning of "jovial, cheerful, jolly and outgoing". "Merry Christmas" in this new context figured prominently in A Christmas Carol. The cynical Ebenezer Scrooge rudely deflects the friendly greeting: "If I could work my will … every idiot who goes about with 'Merry Christmas' on his lips should be boiled with his own pudding." After the visit from the Ghosts of Christmas affects his transformation, Scrooge exclaims; "I am as merry as a school-boy. A merry Christmas to everybody!" and heartily exchanges the wish to all he meets. The instant popularity of A Christmas Carol, the Victorian era Christmas traditions it typifies, and the term's new meaning appearing in the book popularized the phrase "Merry Christmas". The alternative "Happy Christmas" gained usage in the late 19th century, and in the UK and Ireland is the common spoken greeting, rather than "Merry Christmas". One reason may be the Victorian middle class influence in attempting to separate wholesome celebration of the Christmas season from public insobriety and associated asocial behaviour, at a time when merry also meant "intoxicated" – Queen Elizabeth II is said to prefer "Happy Christmas" for this reason. In her annual Christmas messages to the Commonwealth, Queen Elizabeth has used "happy Christmas" far more often than "merry Christmas". In the American poet Clement Moore's "A Visit from St. Nicholas" (1823), the final line, originally written as "Happy Christmas to all, and to all a good night", has been changed in many later editions to "Merry Christmas to all", perhaps indicating the relative popularity of the phrases in the US. In the United States, "Happy Holidays" (along with the similarly generalized "Season's Greetings") has become a common holiday greeting in the public sphere of department stores, public schools and greeting cards. Its use is generally confined to the period between United States Thanksgiving and New Year's Day. American use of the term "Happy Holidays" to replace "Merry Christmas" dates back at least to the 1970s and was a common phrase relating to the Christmas season at least going back to the 1890s. The term may have gained further popularity with the Irving Berlin song "Happy Holiday" (introduced in the 1942 film Holiday Inn). As "Happy Holiday", an English translation of the Hebrew Hag Sameach greeting on Passover, Sukkot, and Shavuot. As "Happy Holiday", a substitution for "Merry Christmas". As "Happy Holidays", a collective and inclusive wish for the period encompassing Thanksgiving, Kwanzaa, Hanukkah, the Immaculate Conception of the Blessed Virgin Mary, the Feast of Our Lady of Guadalupe, the Winter solstice, Christmas Day (The Nativity of the Lord), Boxing Day (St. Stephen's Day), the New Year, and Epiphany. As "Happy Holidays", a shortened form of the greeting "Merry Christmas and a Happy New Year". Critics of "Happy Holidays" generally claim it is a secular neologism. The greeting may be deemed materialistic, consumerist, atheistic, indifferentist, agnostic, politically correct and/or anti-Christianity. Critics of the phrase have associated it with a larger cultural clash termed the "War on Christmas." "Season's Greetings" is a greeting more commonly used as a motto on winter season greeting cards, and in commercial advertisements, than as a spoken phrase. 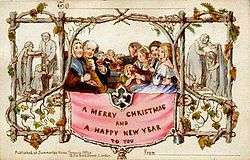 In addition to "Merry Christmas", Victorian Christmas cards bore a variety of salutations, including "Compliments of the Season" and "Christmas Greetings." By the late 19th century, "With the Season's Greetings" or simply "The Season's Greetings" began appearing. By the 1920s it had been shortened to "Season's Greetings", and has been a greeting card fixture ever since. Several White House Christmas cards, including U.S. President Dwight D. Eisenhower's 1955 card, have featured the phrase. Public schools are subject to what the Anti-Defamation League terms the "December Dilemma", namely the task of "acknowledging the various religious and secular holiday traditions celebrated during that time of year" whilst restricting observances of the various religious festivals to what is constitutionally permissible. The ADL and many school district authorities have published guidelines for schools and for teachers. For example: The directive on maintaining religious neutrality in public schools over the Christmas and holiday season, given to public school administrators in the District of Columbia by the Superintendent, contains several points on what may and may not be taught in the D.C. school district, the themes of parties and concerts, the uses of religious symbols, the locations of school events and classes and prayer. In 2002, for the Christmas and holiday season, Moscow mayor Yuriy Luzhkov ordered all stores, restaurants, cafés and markets to display seasonal decorations and lights in their windows and interiors from December 1 onwards. Banks, post offices and public institutions were to do the same from December 15, with violators liable for fines of up to 200 rubles. Every business was ordered to have illuminated windows during the hours of 16:30 until 01:00. This caused a mixed reaction, with people objecting to being forced to put up decorations. ↑ Goff, Kristin. "Ottawa shoppers to drop $3.2 B this Christmas season". The Ottawa Citizen. Ottawa shoppers are in the mood to spend this holiday season and could drop as much as $3.2 billion in retailers' tills, a new survey has found. ↑ Harding, James (December 6, 2006). "Real wonder of Woolies is that it still has a place on the high street". The Times. London. John Lewis, too, has reported a fantastic start to the Christmas season, with sales up nearly 6 per cent on a year ago. ↑ Definition of festive season – Collins Dictionary. Retrieved August 14, 2013. ↑ Wal-Mart sounds ominous note for holiday season – USA Today. November 25, 2006. Retrieved October 27, 2010. ↑ Web retail a bright spot in tepid U.S. holiday season – Reuters India. December 2, 2009. Retrieved October 27, 2010. ↑ Johnson, David. "Origins of the Christmas Holiday". infoplease. Retrieved December 24, 2013. 1 2 3 Yanovski JA, Yanovski SZ, Sovik KN, Nguyen TT, O'Neil PM, Sebring NG (March 23, 2000). "A prospective study of holiday weight gain". New England Journal of Medicine. 342 (12): 861–867. doi:10.1056/NEJM200003233421206. PMID 10727591. 1 2 Allan M. Axelrad (July 2005). "Christmas in Cooperstown and Templeton: The Coopers and the Invention of an American Holiday Tradition". In Hugh C. MacDougall. 14th Cooper Seminar, James Fenimore Cooper: His Country and His Art at the State University of New York College at Oneonta, July 2003. pp. 7–18. ↑ Christmastide – Holytrinitygerman.org. Retrieved August 14, 2013. ↑ Dan Andriacco (2001). "Holy Day Vs. Holiday". 1 2 Don Tennant (November 23, 2011). "Dealing with the 'Christmas' vs. 'Holiday Season' Issue". 1 2 68% Prefer 'Merry Christmas' Over 'Happy Holidays' – Rasmussem Reports. November 27, 2012. Retrieved August 14, 2013. ↑ "Christmas season" vs. "Holiday season" – Google Ngram Viewer. Retrieved August 14, 2013. ↑ Poll: U.S. Split On 'Happy Holidays' Vs. 'Merry Christmas' – Huffington Post. December 16, 2010. Retrieved August 14, 2013. 1 2 Humbug to Holiday: 7 in 10 Canadians Prefer '[https://diwalistatus.co.in/merry-christmas-images-wallpapers-photos-pictures-status/ Merry Christmas'] – Canada.com. December 20, 2012. Retrieved August 14, 2013.– Canadian Olympic Team Official Website. Retrieved August 14, 2013. ↑ Holiday Season Schedules (archived) – DX Group UK. Retrieved August 14, 2013. ↑ John F. Miller, "Roman Festivals," in The Oxford Encyclopedia of Ancient Greece and Rome (Oxford University Press, 2010), p. 172. ↑ Catullus 14.15 (optimo dierum), as cited by Hans-Friedrich Mueller, "Saturn," in The Oxford Encyclopedia of Ancient Greece and Rome, p. 221. 1 2 "The Seasonal Nature of Fires" (PDF). U.S. Fire Administration. January 2005: 15. 1 2 Harn-Shen Chen; Tjin-Shing Jap; Ru-Lin Chen; Hong-Da Lin (February 2004). "A Prospective Study of Glycemic Control During Holiday Time in Type 2 Diabetic Patients". Diabetes Care. 27 (2): 326–330. doi:10.2337/diacare.27.2.326. PMID 14747208. ↑ Heather Conrad; Deforest Walker (October 1, 2001). Lights of Winter: Winter Celebrations Around the World. Lightport Books. ISBN 0-9712425-1-8. ↑ Mike Duff (October 27, 2003). "Consensus: momentum bodes well for 4Q — Retail sales growth, which began to stir in spring, continue gaining through the beginning of next year". DSN Retailing Today. ↑ Lorrie Grant (February 2, 2006). "Retailers celebrate "strong" January sales gain of 5.1%". USA Today. 1 2 Mrickey Alam Khan (November 10, 2005). "Atlas: Online Retailers Will Like Mondays During Holidays". DM News. Courtenay Communications Corporation. 1 2 Simon Crompton (December 10, 2005). "Ills in the aisles". The Times. London. ↑ "Retailers in for a Very Digital Holiday Season, According to NRF Survey". nrf.com. ↑ "Consumers Skip Thanksgiving Leftovers and Kick-Off Holiday Shopping with Strong Spending on Black Friday". Press releases. San Francisco: VISA U.S.A. November 27, 2004. ↑ "Consumers Tighten Their Purse Strings This Holiday Season – Fuel Costs Putting a Damper on Shopping Plans". Mirror Geek. ↑ "report" (Microsoft Word). U.S. Commercial Service in Canada. 1 2 Green Monday And Free Shipping Day Help Boost Online Holiday Sales By 15 Percent To $31B. TechCrunch.com. Retrieved December 18, 2011. ↑ "Holiday Sales Tune-up: Simple, effective tactics to increase seasonal sales" (PDF). MarketLive, Inc. October 24, 2006. Archived from the original (PDF) on September 11, 2008. – This in turn cites the 2006 Holiday Best Practices Report by Shop.org. ↑ "Let the shopping begin". The Economist. November 24, 2006. ↑ "2005 U.S. Holiday Spending Outlook" (PDF). ICSC Research. Los Alamos Chamber of Commerce. October 18, 2005. p. 3. Archived from the original (PDF) on February 27, 2008. ↑ Dave Goll (November 17, 2006). "Extended holiday shopping season bodes well". East Bay Business Times. ↑ "Press Release:Yes, Virginia, There is a Santa Claus; Gift Buying is Expected to Hold Steady, Although Consumers Will Spend Less Overall". Deloitte. November 1, 2007. ↑ Siewers, Alf (November 25, 1987). "He's well-suited to enjoying life of Santa". Chicago Sun-Times. Retrieved December 26, 2007. And so does the culture, with a commercializing of himself that Santa deplores even as he has watched the holiday season creep back to Labor Day. ↑ Maxwell, Kerry (September 18, 2006). "Macmillan English Dictionary Word of the Week Archive – "Christmas creep"". New Words. Macmillan Publishers. Retrieved December 26, 2007. The term Christmas creep was first used in the mid-eighties, though gained wider recognition more recently, possibly due to subsequent coinage of the expression mission creep. 1 2 Sugden, Joanna; Fresco, Adam (December 4, 2005). "An international guide to the January sales". The Sunday Times Online. London. ↑ "French store sales rise in January". Food and Drink Europe. Decision News Media SAS. February 7, 2003. ↑ HINA. "Sezonska sniženja dva puta godišnje, zimsko počinje 27. prosinca". nacional.hr. Retrieved January 13, 2016. ↑ "Shopping". Fulbright Primer (PDF). Fulbright Commission in Berlin. March 20, 2002. p. 44. Archived from the original (PDF) on August 31, 2006. ↑ Paul Joyce (2005). "Opening hours in German-speaking countries". Going Shopping. Exeter University Beginners' German. University of Exeter. ↑ "Unfair Competition Act (German)". ↑ "Julgransplundring: Rocking around the Christmas Tree". Your Living City. January 3, 2014. Retrieved November 21, 2015. ↑ "Top 10 places to spend your Christmas". edition.cnn.com. Retrieved October 12, 2015. ↑ "The Philippines shows the world how to celebrate Christmas - CNN.com". CNN. Retrieved October 12, 2015. 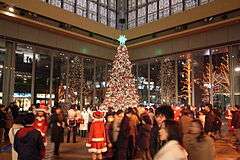 ↑ "Five Christmas holiday locations in Asia | Asian Correspondent". asiancorrespondent.com. Retrieved October 12, 2015. ↑ "6 facts about South Korea's growing Christian population". Pew Research Center. Retrieved October 13, 2015. ↑ Noack, Rick (December 24, 2014). "10 foreign Christmas traditions that Americans might want to adopt". The Washington Post. ISSN 0190-8286. Retrieved October 12, 2015. ↑ "Merry Christmas beats "Happy Holidays" In 2005 Usage". BusinessKnowledgeSource.com. 2005. Retrieved June 12, 2006. 1 2 3 4 Gary Martin (2004). "Holiday Greetings, Merry Christmas". The Phrase Finder. Retrieved June 11, 2006. ↑ Minzesheimer, Bob (December 22, 2008). "Dickens' classic 'Christmas Carol' still sings to us". USA Today. Retrieved May 4, 2010. ↑ Dickens, Charles. A Christmas carol: in prose : being a ghost story of Christmas. Books.google.co.uk. Retrieved December 25, 2012. ↑ The Big Book of Christmas. 1951. ↑ "Why "Happy Holidays"?". Reason Magazine. 2004. Retrieved June 29, 2008. ↑ "Maryland Historical Society Library Devotes Exhibit To Holiday Cards". Antiques and the Arts Online. 2005. Retrieved June 29, 2008. ↑ "Season's Greetings from the White House". The White House. Retrieved June 29, 2008. ↑ "Safety First" (PDF). British Columbia Safety Council. Spring 2006. Archived from the original (PDF) on February 27, 2008. ↑ David P. Phillips; Jason R. Jarvinen; Ian S. Abramson; Rosalie R. Phillips (September 10, 2004). "Cardiac Mortality Is Higher Around Christmas and New Year's Than at Any Other Time" (PDF). Circulation. 110 (25): 3781–3788. doi:10.1161/01.CIR.0000151424.02045.F7. PMID 15596560. ↑ Michael Gallinger (November 28, 2005). "Christmas and holiday season Tips" (PDF). Asthma Society of Canada. ↑ "Tips for a "Green" Holiday Season". Stanford Recycling Center. Archived from the original on July 7, 2010. ↑ Peter Klinger (December 29, 2005). "Thousands shiver as gas boiler failures double". The Times. London. ↑ "Candle Saafety Tips" (PDF). Government of Alberta Ministry of Municipal Affairs. April 8, 2003. Archived from the original (PDF) on May 8, 2007. ↑ Kelly Grinsteinner (November 28, 2005). "Controlled drinking experiment teaches valuable lesson". The Daily Tribune. Archived from the original on February 23, 2008. ↑ Abraham H. Foxman. "The "December Dilemma": December Holiday Guidelines for Public Schools". Religion in America's Public Square: Crossing the Line?. Anti-Defamation League. ↑ "Religion in the Public Schools: Teaching About Religious Holidays". Anti-Defamation League. ↑ Paul L. Vance (December 14, 2001). "Religious Neutrality Requirements" (PDF). Archived from the original (PDF) on February 27, 2008. ↑ Oksana Yablokova; Kevin O'Flynn (November 29, 2002). "Moscow To Pay a Price for Not Celebrating". The St. Petersburg Times. Tom I. Romero, II (December 2002). "Bah Humbug! Colorado Law and the Christmas and holiday season". The Colorado Lawyer. 31 (12): 139.